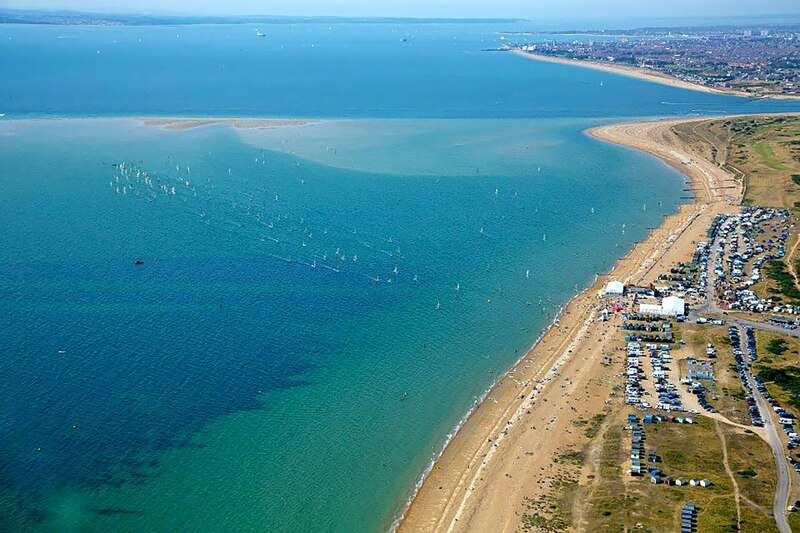 Hayling Island is the birthplace of windsurfing and rightfuly boasts some of the best kitesurfing conditions in the world, the East Winner sand bar which appears 4 hours either side of low tide creates a huge flat shallow lagoon for over a kilometre out to sea producing perfect learning conditions, which can be ridden in any wind direction. 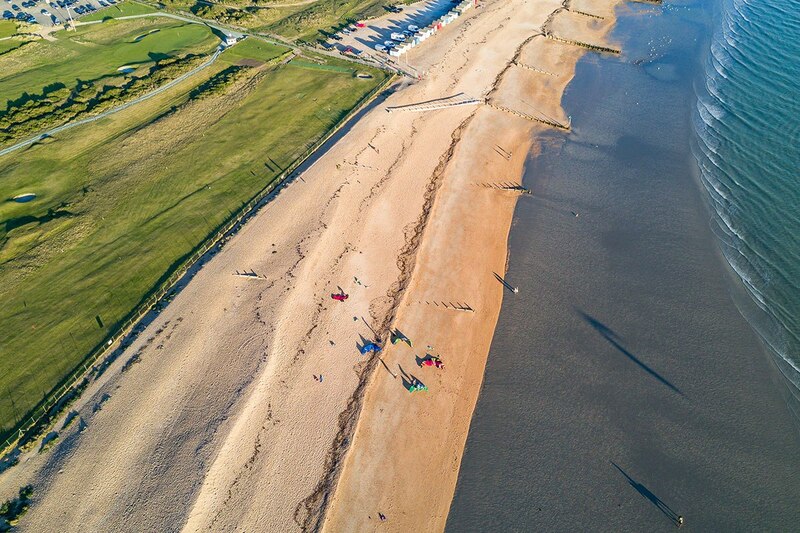 We are in the unique position of being the only school to operate on Hayling Island, and we have our own dedicated teaching areas in flat, shallow, sandy water. Most other schools on the South coast can only operate in certain wind directions, but because of the unique conditions at Hayling we can operate in all wind directions. This means our courses are rarely cancelled. Hayling is accessible from most South East locations and is just over an hour’s drive from London. 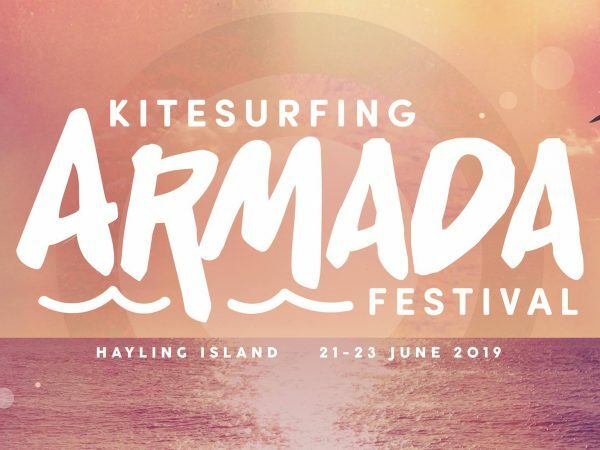 There is plenty of car parking, toilets, places to grab food and drink and if you are bringing family or friends with you who are not doing a course, they can always enjoy watching you over a drink from the comfort of the Inn on the Beach which has panoramic views of the kiting area. Hayling is a fantastic location but conditions vary greatly depending on the wind direction combined with the tidal state. Wind direction is important but equally important is the strength and speed of the wind. 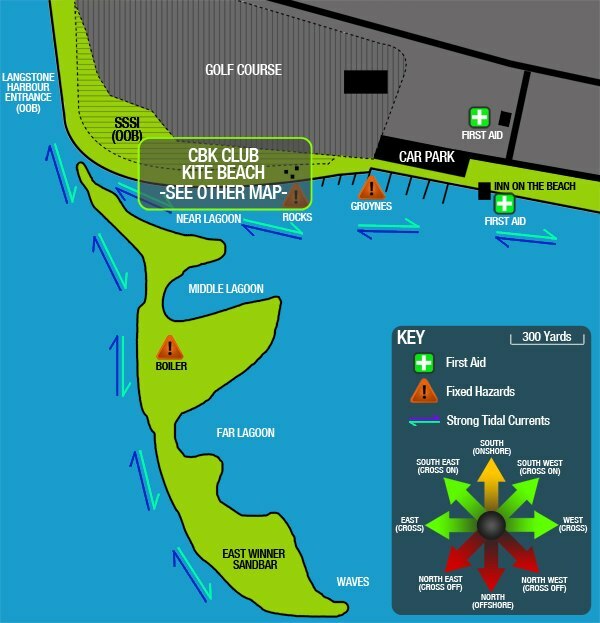 By virtue of CBK’s boat facilities many more wind directions are kiteable, as we will look to ferry kitesurfers to different parts of the sandbar, or alternatively to supervise to allow safe kitesurfing in offshore winds. The wind direction guide should provide you with general information about kiting in different wind directions, although the strength of the winds and the tide state will also have a significant impact on the suitability of conditions. South Onshore Exercise caution especially when busy. If you are underpowered do not ride as you risk dropping your kite on the beach. It is very difficult to get away from the beach particularly if it is busy. Try to ride or walk out to the sandbar and kite in the mid/far lagoon to reduce beach congestion. The kite rescue boat will look to provide transport for CBK members to the sandbar in these conditions. Remember that in these conditions your kite can fly over the beach and presents a risk to the public. No tricks unless you are 2-3 lines lengths away from the beach. Onshore Classic Hayling conditions particularly when the sandbar is exposed at low tide. Flat water in the lagoons and waves on the outside if there is a swell. Perfection! High tide can be a little choppy. Shore Excellent conditions particularly when the sandbar is exposed. Flat water in the lagoons. Probably the best direction for waves if there is a swell. Offshore No kitesurfing recommended. 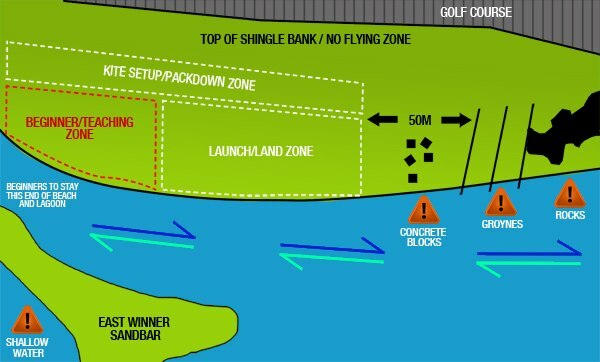 At low water (springs) the sandbar will be exposed and it may be possible to kitesurf further out. The beach will be in the lee and it is difficult to keep power in the kite near it. It will also be gusty – these are the conditions when lofting most often occurs. North Offshore No kitesurfing. In Northerly winds you should go to Ryde Sands, IoW. Drive to Southsea, get the hovercraft to Ryde (10 minutes) and walk 5 minutes to the beach. Offshore No kitesurfing. 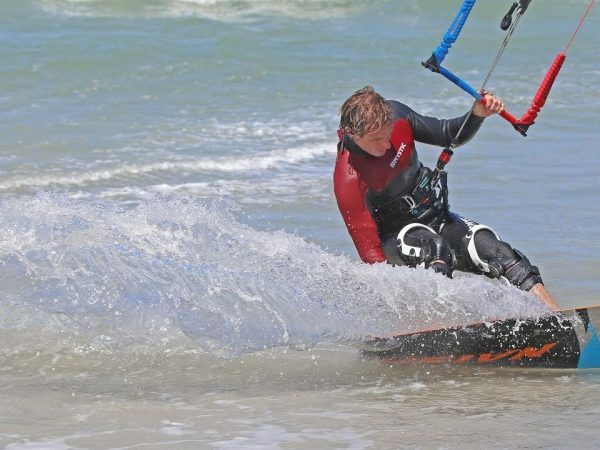 If you are desperate to kitesurf, go to Pagham or Ryde Sands, IoW. Otherwise you need to move to the East coast. Shore Average conditions although the lagoons are choppier as the sandbar does not provide shelter. Waves will be mushy if there is a swell as the wind collapses them. 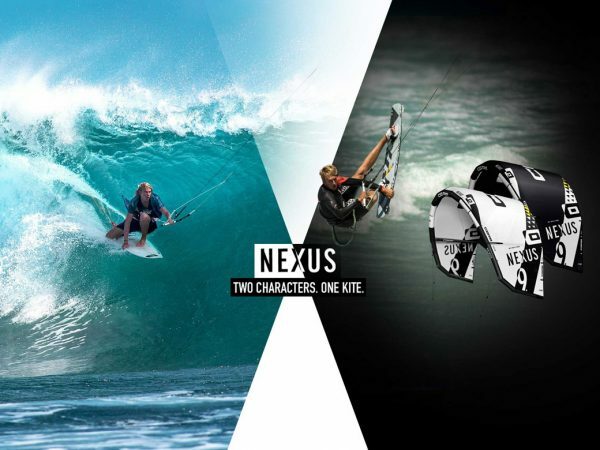 This is a good direction for kiting around the sandbar – beware of the currents on the West side though. The wind from the east is cold in the winter and warm in the summer, it tends to be a little less powerful than wind from the west. Onshore Good conditions although the lagoons are choppier as the sandbar does not provide shelter in this direction. There will be waves on the outside if there is a swell but they tend to be mushy. Great jumping conditions. When the wind is from the North, North East or North West check the CBK website to see when the rescue boat is providing ferrying to the sandbar and safety cover. The best tidal condition for Hayling is low water to mid water. Avoid high water and from 1 hour either side. Spring tides are preferable as more sandbar is exposed and the flat water lasts for longer before the sandbar is covered and the chop appears. Tidal streams at Hayling can catch you out. See the Kitesurfing Area Map of West Beach for the diagram of the main tidal streams to be aware of. The near lagoon appears relatively benign however there are strong tidal streams running across the front of the beach on both incoming and outgoing tides. There are also very strong tidal streams running North/South along the West of the sandbar. Both these tidal streams are generated by the water moving in and out of Langstone Harbour.